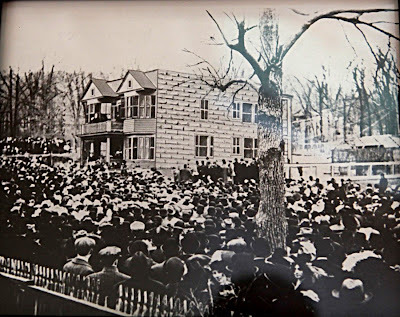 Gathering for a Cause: The Botto House and 1913 Silk Workers Strike ~ The History Girl! North of the City of Paterson, New Jersey, is a small, working-class suburban community. Originally settled by farmers of Dutch heritage, this area developed into a blue-collar community called Haledon, after the Civil War. It served as a suburb to its industrial neighbor Paterson. Small lots closer to the Paterson border housed working-class citizens and immigrants, while the further away from the city you traveled, the lots became larger for more ornate Victorian mansions and villas for prominent politicians and factory owners. It was the working-class that would define Haledon after it emerged as its own independent Borough in 1908. 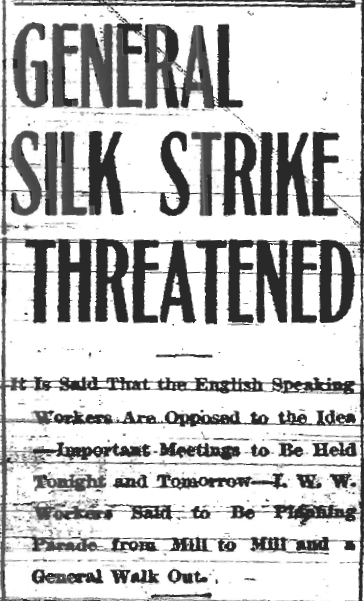 Its sympathetic mayor enabled striking silk workers to congregate in retaliation of the treatment received in Paterson, allowing for a large movement that may not have accomplished what it set out to, but set the stage for future battles in labor reform. Between the 1850s and 1880s, Paterson rapidly developed into an industrial city and earned the nickname "Silk City." The mills required skilled and unskilled laborers to run the many machines and processes in the production of silk and other fabrics. In 1900, 175 companies in Paterson employing 20,000 workers, processed two-thirds of all silk in the country. By 1912, the number of mills recorded in the Industrial Directory of New Jersey numbered 160, employing a staggering 30,000. Paterson became the home for thousands of immigrants who were employed in the mills and factories. Many unskilled workers were paid by the piece and had to bring extra work home to make a livable wage. All workers were expected to put in ten hour days, plus an additional half day on Saturday. Despite this demanding schedule, families struggled to make ends meet, as wages were set well below what silk workers in other cities made. In Europe, loom operators and ribbon makers were considered to be highly skilled artisans. Unhappy with the grueling and demanding working conditions, strikes were not uncommon in Paterson. Between 1880 and 1910 at least 140 strikes or work stoppages were recorded. Mill owners, seeking to make the most profit, lowered wages and increased workloads. On January 27, 1913, the Henry Doherty Silk Mill, Paterson's largest, introduced the "four-loom" system, which would double the silk output and force workers to operate double the machinery. The silk mill workers were not pleased. Eight hundred workers walked off the job that day. The Paterson Evening News, February 21, 1913. The disgruntled workers reached out to the International Workers of the World (IWW), known as "Wobblies." 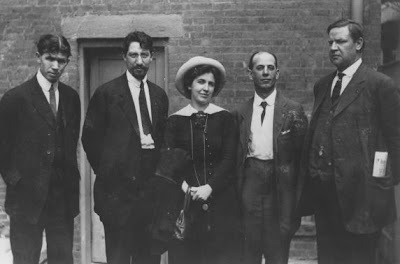 In mid-February, IWW organizers Elizabeth Gurley Flynn, Carlo Tresca, and Patrick Quinlan arrived in Paterson. They had been known for organizing a successful strike of textile mills in Lawrence, Massachusetts in 1912. Immediately, a central strike committee was formed. The committee united the various crafts and ethnic groups. Other committees were established to handle communications with the various crafts, to manage a strike relief fund, arrange for social activities, inform other silk workers outside Paterson about the strike, arrange for legal help for arrested strikers, and manage all the other issues and affairs that may arise. On February 25, 1913, the executive committee issued the call for a general strike. Between 23,000 and 25,000 workers answered the call, bringing production in Paterson's mills to an utter stop. Broad-silk weavers struck first, followed by dyers' helpers. Mayor Andrew McBride ordered police to arrest the members of the IWW. After a rally at Turn Hall, at the corner of Ellison and Cross Streets, on the first day of the general strike, Elizabeth Gurley Flynn, Carlo Tresca, and Patrick Quinlan were met by Police Chief John Bimson. Bimson told the strike organizers that they had two choices: either leave town or be arrested. The organizers decided to stay and were arrested. They were charged with inciting a riot and held for $1,000 bond. This would not be the last time they were arrested during the strike. On March 5, William "Big Bill" Haywood would join the leadership and assist the strikers. IWW Strike Leaders: (l to r): Pat Quinlan, Carlo Tresca, Elizabeth Gurley Flynn, Adolph Lessig and Big Bill Haywood. Because of Paterson's unfriendly attitude toward the strikers and union gatherings, IWW organizers sought a safer location to hold meetings. Haledon, to the north, was home to many unskilled workers and its mayor was sympathetic to their cause. The Pietro Botto House became the focal point of future meetings of the strikers, their leaders, and sympathetic visitors because it was surrounded on three sides by trees and had a large lawn, which acted as a natural amphitheater. Every Sunday from the beginning of March until July 20, this house, the home of an Italian immigrant named Pietro Botto, himself a weaver, served this purpose. Pietro worked at the Cedar Cliffs Mills in Haledon as a silk weaver. Ironically, Pietro Botto had no personal interest in the strike, yet his home became the center meeting place for strikers. His wife, Maria, took care of the home and the activists while the strike occurred. "Enclosed almost semi-circularly by the fringe of a wood, with many men and boys perched in bare trees, between 15,000 and 20,000 persons attended the Haledon meeting yesterday," reported the Paterson Evening News on April 7, 1913. "The crowd gathered in front of the residence of Peter [sic] Botto, on Norwood Street, and for several hours listened to speeches delivered from the upper balcony." In addition to being a general meeting place, the house's grounds also served as a place for songs and skits to be performed, in an attempt to boost the striker's morale. The Botto House is a Victorian home, constructed in 1908. It is a two-story, rough-cut block building with a wooden clapboard front facade. The front door is flanked by two, two-story bay windows on each side. Above the front door is a balcony, from which the speeches by strike leaders were delivered. At the rear is a large, two-story, enclosed wooden porch which in 1913 was open. Inside, the center hall is flanked by two large rooms on either side in the front and smaller rooms in the rear. The house has been interpreted to 1913, featuring typical furnishings and clothing that would have been found in the home. Gathering at the Botto House, 1913. The size of the crowds at Botto's house ranged from 5,000 to 6,000 up to 15,000 to 20,000. The meeting held on May 18, 1913, was one of the largest. Patrick Quinlan had just been convicted of inciting a riot because of his speech at the funeral of a man killed by a security guard hired to protect one of the mills. The strikers cheered for fifteen minutes when he took his place on the Botto balcony. Other speakers that day included Elizabeth Gurley Flynn, Carlo Tresca, Bill Haywood, Fred S. Mowell, a socialist from New York, Upton Sinclair, a popular muckraker, and Frederick S. Boyd, a leading socialist. 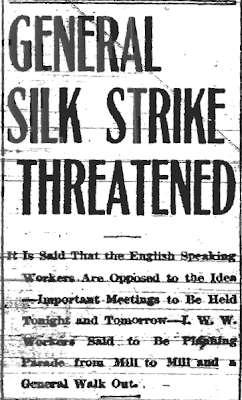 The Paterson silk mill owners were not easily intimidated by the strike or the IWW's efforts. Instead of trying to compromise, the mills began transferring production to out-of-state factories. Over the course of the strike, over 2,000 strikers were arrested, union meetings were banned, and strike literature was confiscated. The strike caused a divide in Paterson. During past strikes, the community usually sympathized with strikers. Yet this time, the mill owners and managers, the mayor, the chief-of-police, the judiciary, the clergy, the local press, and most of Paterson's middle class professionals and merchants were on one side and the workers were on the other. On June 7, 1913, the strikers attempted to fight back against the stubborn mill owners with a large pageant, dramatizing the plight of the silk worker. The pageant was organized by artists based in Greenwich Village, New York. The organizers hoped to be able to raise enough money to keep strikers fed and housed until a resolution was achieved. This pageant was held at Madison Square Garden but did not end up making money. It did however, raise international attention for the worker's plight. The strikers used many tactics throughout the course of the strike. One of the most effective tactics the IWW employed in the Lawrencce strike was to send children out of the city to live in foster homes until the strike ended. This had created a public relations nightmare for the mill owners as scenes of dirty, poorly dressed children being taken from their parents stirred the emotions of the general public. The IWW sent out approximately 300 children in May of 1913 to New York City, but it failed to garner the same sympathy from the public. Strike organizers established picket lines, flooded the local jails with strikers, and sensationalized events that occurred during the strike. The pageant provided a small, but short-lived morale boost. By the end of May, neither side had come to and agreement over minimum terms and were in a stalemate. Workers began to slowly cross the picket lines and return to work by mid-June despite pleas from strike leaders. The English speaking and better paid weavers, twisters, fixers, and warpers were the first to return to work. In July, the central strike committee voted to endorse a shop by shop settlement, thus ending the strike. The workers did not gain an eight hour work day or better pay, but the mill owners relented on the four-loom system. Workers would not gain the eight hour work day until 1919. While the strike did not achieve any immediate results, it did have lasting effects. It was successful in documenting the plight of immigrant workers. 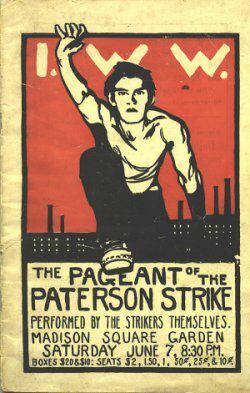 The strikes in Lawrence and Paterson received national attention and helped lay the groundwork that eventually led to reforms such as minimum wages, the forty hour week, and child labor laws. When asked in 1914 what Doherty's introduction of the four-loom system meant to the weavers, Thomas F. Morgan, a union leader, replied, "Well, it meant this to the workers; if one weaver ran four looms where he formerly ran two, every other weaver would be thrown out of work." The rally and perseverance among immigrant workers in Haledon and Paterson will always be remembered by visitors to the Pietro and Maria Botto House, as it relates the story of the ethnic groups that once dominated the industries that enabled Paterson to become the "Silk City". For its national significance in the labor movement, the Botto House was designated a National Historic Landmark in 1982.